Apprentice Boys across the Province are gearing up for the Relief of Londonderry parade, pageant and celebrations in the city on Saturday. Plans are in place for 146 bands, 9,000 Apprentice Boys and 30,000 visitors to converge on the city. 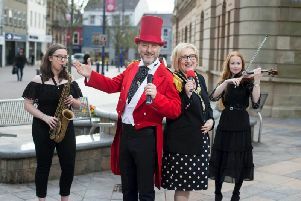 The event brings a conclusion to the week-long Maiden City Festival, now in its 19th year, which has been taking place this week and bringing the old city to life through music, dance, theatre and pageant. Festival director Jonathan Burgess said funding cuts had caused difficulty in recent years, but the festival committee had still managed to add events. “We are animating the walls every day from 10am to 5pm with a dozen actors,” he said. Throughout the week, the festival has seen a diverse programme of Ulster-Scots music from bands such as King Blue, Cat & The Lillies, The Down & Out Bluegrass Band, and The White Mansions. And on Thursday morning the Ulster Highland Dance Championships will begin at 10am in the Memorial Hall in Society Street. Jim Brownlee, governor of the Apprentice Boys of Derry, said the festival was an opportunity to celebrate what he called ‘Plantation culture’. “This is a very historical city,” he said. “Obviously the Siege would be the thing that people think about, but it’s not just about the siege, it’s about the community that came out of the Siege. “It’s about the development of that community right up to the present day. “We feel that if we look at the city today we have a city that is very rich in history, very rich in culture and very rich in diversity. “From the Apprentice Boys’ point of view, we were challenged in the 1990s when there was opposition to our parades, so we felt we would have to reach out in a way which was not parade-related – and that became the Maiden City Festival. The Relief of Londonderry Parade on Saturday begins at 9.30am with the eight parent clubs parading around the walls before walking to St Columb’s Cathedral for a service of Thanksgiving at 10.30am. The main parade begins around noon at Craigavon Bridge, going through the city centre and then passing through the Fountain Estate before crossing Craigavon Bridge and returning to the Waterside. The day’s events end with the eight parent clubs returning to within the city walls, finishing at the Memorial Hall.